Christmas season is extra “wonderful” in the Finger Lakes region of upstate NY. 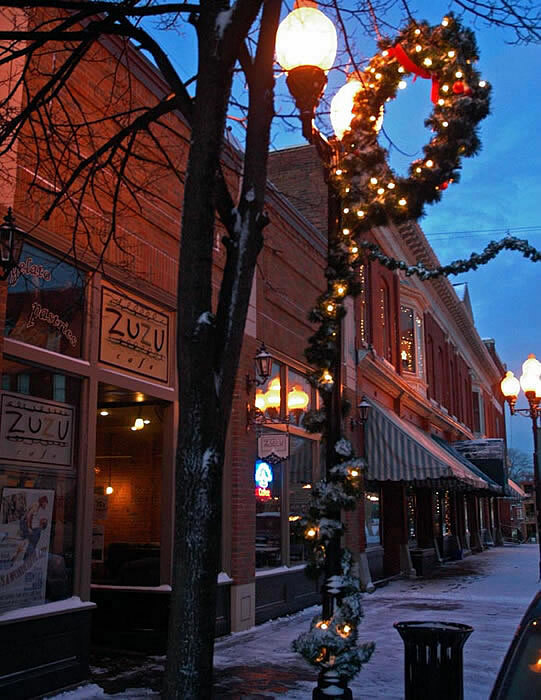 The idyllic town of Skaneateles hosts Dickens Weekends in December, with costumed participants roaming the streets while shopkeepers and strolling carolers welcome shoppers and big fluffy snowflakes too. If you love a Victorian Christmas, watch for my post Prince Albert is to Blame coming Dec 21. But enough advertising . . .
Today's HISTORY post is all about The Real Bedford Falls. 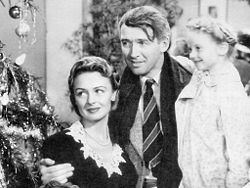 Do you love "It's A Wonderful Life"? The movie is based on “The Greatest Gift,” Cover via Amazonwritten by Civil War historian Philip Van Doren Stern. The story goes that Stern got the idea while shaving one morning in 1938, shopped it around with no bites, and later decided to just send the story out with his next Christmas card mailing. Somehow the story ended up before movie producer Frank Capra. Capra jumped on the idea for a movie and was in New York City in November 1945 trying to talk Jean Arthur into the female lead. From there he supposedly left to visit his aunt in Auburn, NY, and likely would have traveled up through Ithaca and Seneca Falls. A barber in town, Mr. Bellisima, recalled a discussion about family roots in Italy, with a man named Capra and didn’t realize a ‘celebrity’ was in his shop until the movie came out. This isn't a scene from the movie, this is Seneca Falls N.Y. What do you think? It’s quite possible Capra crossed the steel bridge and caught sight of a plaque honoring Seneca Falls resident Antonio Varacalli. In April 1917, this hero dove into the icy canal waters to rescue a girl attempting suicide. Varacalli saved her but he was overcome by fatigue from the rescue and drowned. If the town fit the setting Capra had in mind, then the bridge and this story would have sealed the deal. 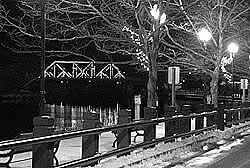 So little Seneca Falls NY claims the title “The Real Bedford Falls” based on a lot of ‘evidence’—debatable, sure, but who wants to argue with so much good feeling? Karolyn Grimes, the movie’s ZuZu comes each year to lead the festivities when Seneca Falls hosts the “It’s a Wonderful Life” Festival. "Zuzu" has her own amazing story and spreads cheer and encouragement year round, and I’ve enjoyed meeting her in person. Last year I went to the cinnamon-bun eating contest hosted by the Spencer and Galloway familes at ZuZu's Cafe. Please check out links below for all the activities available. This year's celebration is Dec 10-12, but Seneca Falls welcomes visitors all year as it's also the home to the National Park Service as the Birthplace of Women's Rights. Come and visit the Finger Lakes. We love tourist dollars! 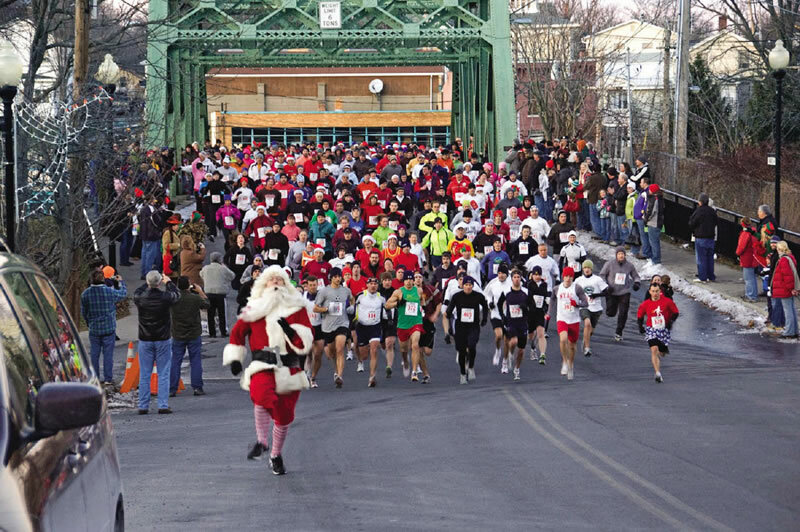 Above, "It's A Wonderful 4k Run" breaks across what has become known as the George Bailey Bridge. Also, a view down Main Street . . . Thanks for sharing some of the history of It's a Wonderful Life! We named our farm "Bedford Falls Farm" twenty-two years ago because we just over the top with George and Mary Bailey. Aw, gee whiz, who doesn't love that kid? Thank you for this wonderful post, for this delightful trip down memory lane. People should flock to Seneca Falls in droves and just sigh. Hugs to you and I'm sharing my home-made cinnamon rolls with you. Love the Inkies. Thanks Ruthy! and not just for the buns. Cinnamon Buns are one of my weaknesses. Don't you love how Lisa decorated for us? So come on down. You know what's great? Zuzu grew up to be an amazing caring, giving woman who has devoted herself to reminding people of their worth. That's a Hollywood story worth telling. If you've considered books as Christmas gifts this year, check out the graphic at the top of our page - 75 Authors offering signed books all in one-stop shopping. Multiple genres. Click on the link and see what I mean. Hey, don't forget to come back to Inktropolis when you're done. Wow, I had no idea it was based on a real story! I love that movie. Thanks for sharing this. If I ever take a vacation to upper New York, I'll have to find this place. Hey Victoria! thanks for dropping by. I'm glad to have provided a little background for the movie. I love the idea of Frank Capra going through the town and having a "lightbulb" moment. Next time you watch it, you'll notice the reference to other towns in Upstate NY--certainly places Seneca Falls as Capra's inspiration. Very cool post! I love how we can find stories all around us, no matter where we are. Our region's claim to fame (besides being the site of the last Indian uprising in the US) is our proximity to the area where famous outlaws and their gangs (like Butch Cassidy and the Sundance Kid) had their hideouts. Not very Christmas-y, LOL. Next time I watch the movie I'll think of you, Deb! Hey, Debbie, you can make anything come alive. I sure wish I could be with you for the annual Festival. Our annual watching of the movie will have more meaning this year. Thanks for a fun post and trip down memory lane. Have a blessed Christmas. Why did she give it to a museum instead of leaving to family? Did she have family? Did she not trust her family to value and protect the collection? Or did she care more about her legacy? Very cool post, Deb! I love this movie. Just goes to show that one person can make a huge impact on the world. Hey ladies, thanks for the comments. I'm glad you enjoyed a little 'behind the scenes' look. While I love this movie, my favorite is really White Christmas. Just keep that to yourselves, will you? Connie I was hoping you'd stop in because I know you and Bob love this movie. And we love seeing you here! Gina, I think that sounds like a pretty interesting story too. And I completely understand the need to return without the fam. Let us know what you find out - or tell us when you've completed the manuscript! Hi Jen! I'd like to find more about the book's author as well. I didn't dig that deep, but he probably expected his civil war history books to be his 'claim to fame'. Yet here we are discussing him today for something he may have done as a lark. Deb, this was a fun post! How cool! Like Niki said, there are so many stories all around us, some famous, and some less-so, but inspiration is everywhere. CARY GRANT! That's enough for me. Thanks for the tip! The Bishop's Wife is going on my netflix queue. I loved this post, Deb. Just like a cranberry bliss bar from Starbucks. Sweet and chewy. Ooh, Susie, I've never heard of The Bishop's Wife. I'm going to google! Connie, I'm so glad to see you here today!! Cranberry Bliss Bar, huh? Now, to truly understand your meaning, I'll have to try one. Hallmark channel has provided us with a huge number of Christmas movies over the years. We always watched Miracle on 34th Street too which fell somewhere between my mother's youth and mine. I can also say that to this day I have never sat through the entire 'Christmas Story' or whatever that movie is where the kid gets his tongue stuck to the pole, and his dad has a 'leg lamp'. I also love Elf, The Polar Express and I'd love to see the Patrick Stewart version of A Christmas Carol. Oh Deb, Cary Grant as the angel in The Bishop's Wife is just a doll. On ice skates, no less. We love A Christmas Story! And the leg lamp! Next year I'm putting Seneca Falls on my December weekend schedule early. But next year we'll schedule around it and make it a day trip. With babies, no doubt! Well, Ruthy, you'll have to let me know and we'll check out the schedule of events! Welcome, Guest Blogger Author Ruth Logan Herne! You Wouldn't Lie to Me, Would You?